Just when we thought August was going to be a slow month around these Verizon parts, we get slapped with their latest MAP (minimum advertised price) list that includes some pretty major players. The first one we’ll talk briefly about is in position 1 as the Motorola MOTXT875, which many of you may know as the brand new DROID Bionic. But since we’ve been told that it won’t be out until September, let us quickly move on to devices that could be out before it ever sees a store shelf that are also on the list. I’d say that the most important and intriguing device that we should point out is in position 3 as HTC ADR6425, which many of us were first introduced to last week as the HTC Vigor. To refresh, this would be the device with the 720p resolution, the 1.5GHz dual-core Snapdragon processor and the brand new Adreno 220 GPU. Yep, if those specs actually do come true, then we’re looking at one of the most powerful and impressive devices on the planet. 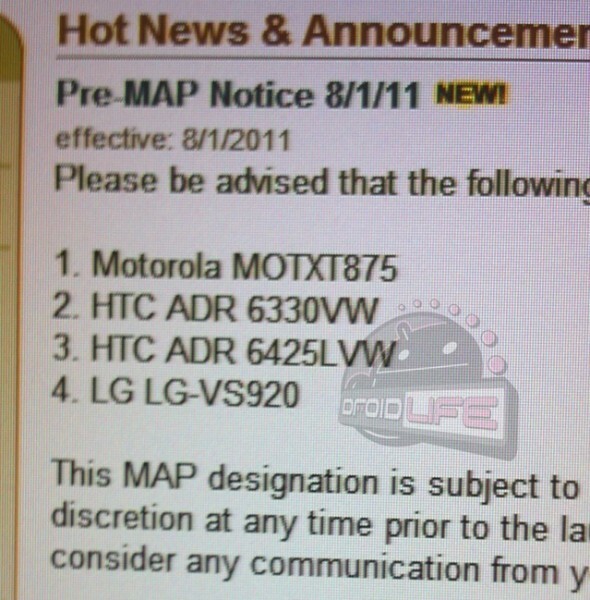 The next device we should take a look at is the LG-VS920 which could be the follow-up to the Revolution (already). The original Revolution is model number LG-VS910, so this easily seems like some sort of a new build. It has received it’s Bluetooth certification already and definitely has LTE capabilities. Revo 2, anyone? And the last device to point out is ADR6330, which we know nothing about. What we do know is that the model number sort of matches up to the Incredible line, so it could be the silver and white edition that we saw this morning? Well maybe, except that the Incredible 2 that you can buy now is ADR6350. It almost seems to be a device below the Incredible 2, but what could it be? We’ve heard rumors of a new HTC global roaming device with a keyboard similar to the Merge – could this be it? A lot of questions for a bunch of devices, that so far, we don’t know much about. So when should we expect some of them to arrive? MAP listings aren’t necessarily good gauges for a release, but they are at least a sign that we should see them sooner rather than later. With no current plans that we know of for August from Verizon, we wouldn’t be surprised if we see at least one of these in the next few weeks, before the Bionic drops. We’re hoping to know more very soon.